If the Zebra F-301 Ultra is an upgrade from the original Zebra F-301, then the Zebra F-402 is like a double-upgrade. It’s noticeably heavier, the barrel is a little bit longer, and all of the plastic has been replaced with stainless steel. But best of all, the F-402 is thicker and, like the F-301 Ultra, the hard grip section has been improved with a comfortable, rubberized material. 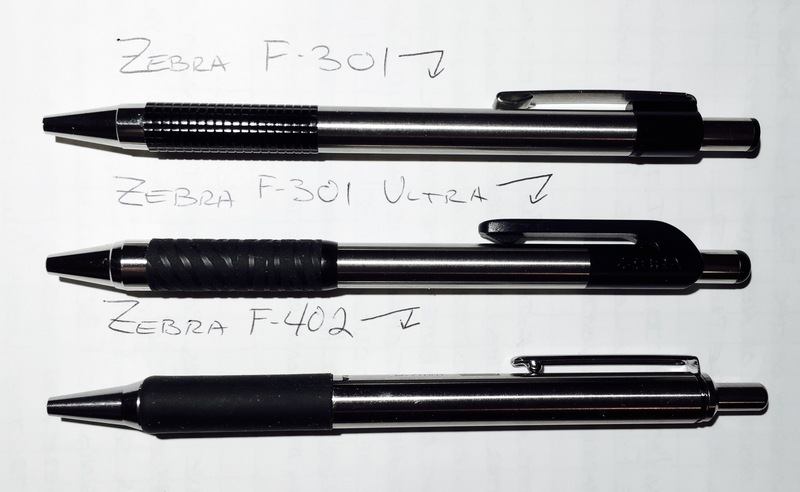 The only thing that hasn’t been upgraded between these three iterations – the F-301, the F-301 Ultra, and the F-402 – is the 0.7mm ballpoint refill. That’s not to suggest that it’s a bad refill, just mediocre when compared to the smoothness of the Pilot Acroball or the usefulness of the Fisher Space Pen refill. While the extra heft of the F-402 gives some gravity-assist to what is normally a cramp-inducing writing experience, the pen would still be much better with a higher quality refill. But if you are a fan of the F-301, then the F-402 is worth trying. At 2 or 3 dollars per pen, it doesn’t cost a much more than the F-301. Yet it’s a more substantial, nicer pen overall. And, more importantly, the F-402 is a lot more comfortable to write with. Review at The Newsprint. He liked the F-301, he loves the F-402. Lots of good pictures here too. A review at Street Articles by user Billy2. He briefly mentions that the F-402 has a good clip, and, in fact, it’s a lot sturdier than the clip on the F-301. I’ve linked this before, but here’s a good comparison of the F-402 against the F-301 and the G-301 – the gel version of the same pen, see my review here. The gist of the comparison: don’t waste your money on the F-301 at all, just go for the F-402.